The Stinger Arete is a V4 boulder problem in the Highlands area of Elk Ridge, MD. It is a long overhanging problem that follows the right arete of the overhanging wall. There are two main exit options and the grade fluctuates a little between the two. You can easily step off of the problem at any point because the ground mirrors the angle of the wall. The arete has a mix of jugs, downsloping rails, and crimpers linked by flowing moves. The difficulty crux seems to be the powerful first move though the problem it isn't over until you manage the sloping topout. 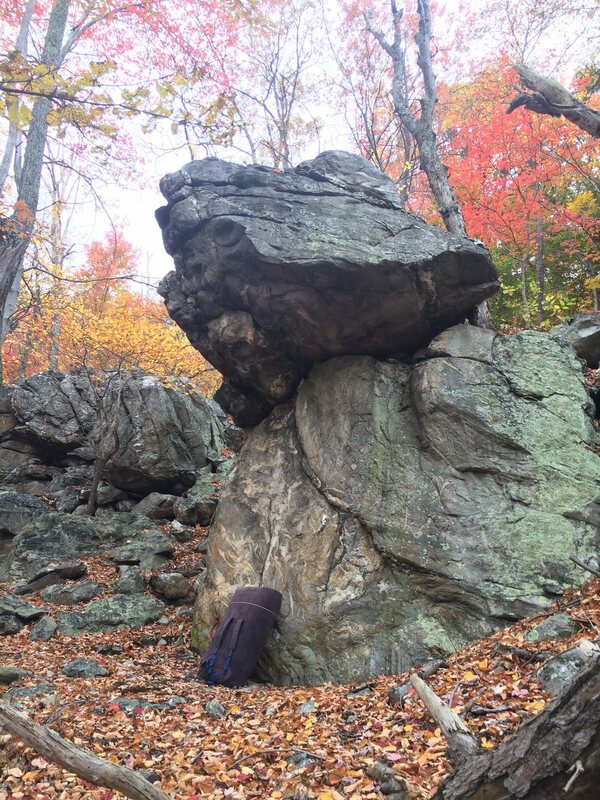 The Secret Six (V5) is a bouldering problem in the Tiers area on Elk Ridge, MD. It is found on the overhanging side of the tall skinny block that also hosts John Browns Body and Isaac Smith Arete. It is maybe 50 feet uphill from the road. Drew sitting at the base of the problem preparing for a go. In this photo, you can see the opposing starting vertical sloper features and the right hand crimper divet as well as the first vertical sidepull for the right hand. More bouldering photos have trickled in from this past Saturday, November 12, 2016. These are all compliments of Coco Boan. Thanks to her for taking pictures and sharing them. Jeff spotting Drew on a problem in the Outlying Area. 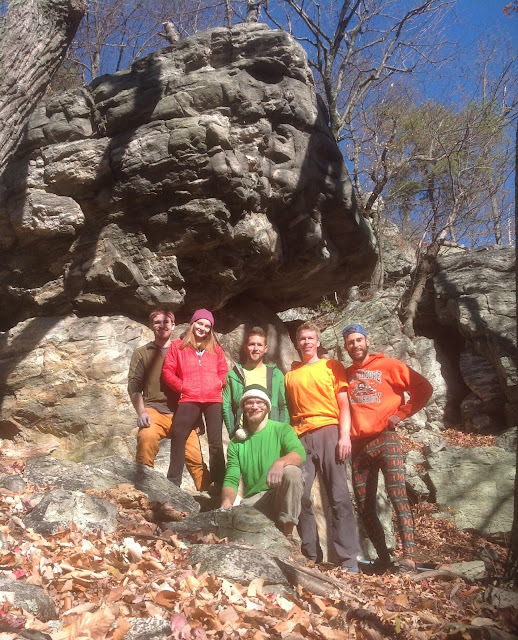 This past Saturday, eight climbers met in the woods at the base of Elk Ridge, MD to boulder and rope up on the quartzite stone. For those of you who don't boulder in the woods of Harpers Ferry you probably don't know that most of the time it's you and the trees. Eight people together makes the woods feel crowded to those of us who are often by ourselves so we joked that we were feeling claustrophobic. In reality we were quite happy to be sharing our climbing with others. When me met, not one person knew everyone else. We were all a stranger to someone. By the end of the day though, that was no longer true. We had new friends and great memories. The strangest of all of us was my friend Scott. He was in Maryland helping me with a job. He lives outside Santa Fe, New Mexico, and had never been to the mid-Atlantic region before. I was beyond happy to have him up and to show him Harpers Ferry climbing and to have others join us and make it a more social day. Scott climbs a lot of fantastic stone in New Mexico, including quartzite, and likes a little spice in his climbing diet. There were a lot of climbs I wanted to show him but I definitely had one thing in mind as a goal. On my way to and from last weekends bouldering excursion on Elk Ridge I noticed the Guide House Grill is the newest establishment in the old Cindy Dee Restaurant location. The Cindy Dee had shut down and was replaced by a family restaurant for about a year. The Guide House Grill has taken up the location and it looks like a great prospect for post-climbing trip dining based on their website, menu, and speaking with them personally on the telephone. I was unable to stop and eat because of family obligations but I intend to have a personal experience first chance I get. Their logo includes a paddle so I asked if they were boaters, meaning river lifestyle outdoor enthusiasts. They are. The boater community is a brother/sister community to the climbing community in Harpers Ferry, shares a similar dietary intake to climbers, and also worth noting that the community is admirably successful in procuring boater access privileges to parking and their resource. I say these things because I used to kayak and be a part of the community. I have long tried to promote, and quite unsuccessfully, eating options in Harpers Ferry and to promote an establishment where a community could spontaneously occur "off the rock", meaning not at the crags or boulders. I think the primary reason for the lack of success is that the options I promoted always had an access catch, but what could I do about that. They were out of the way or had strange hours or were more touristy establishments with mediocre food. The Guide House Grill has none of the previous catches as far as I can tell. The only current downside seems to be that they don't yet serve alcohol. I say "yet" because in my telephone conversation I was informed that they have submitted paperwork to be able to serve alcohol and are hoping that will come through by mid-late November of this year. I don't know about you but delicious brews shared with friends are much desired after any climbing session. Please, check out their website and menu and they even have a Facebook page to follow. Judge for yourself and let others know. It would be really nice if they succeed in filling the role of a local restaurant that serves healthy food and delicious brews with easy access for hungry, parched, chalky palmed climbers. Hope to see you there! 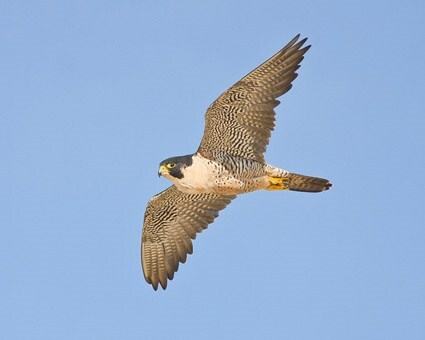 The above is follow up information related to the latest peregrine falcon discussion (2 posts below - "Falcon Nesting Efforts & Rock Climbing Activity"). 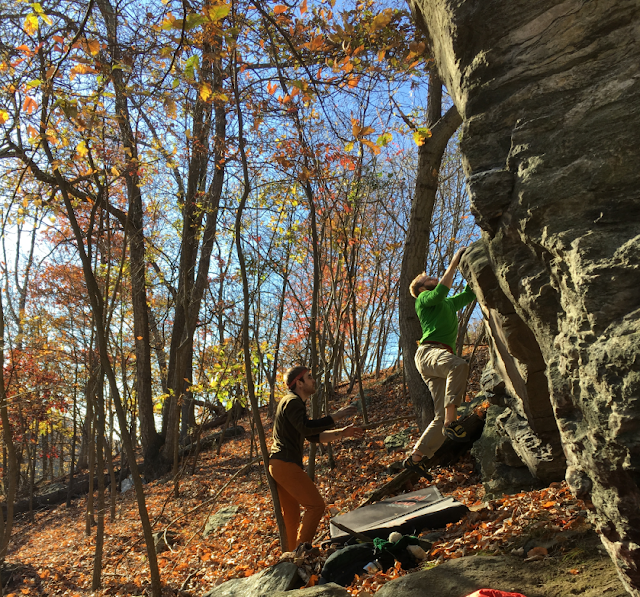 The great temperatures, dry air, and the coming of fall colors set the stage for a perfect day of bouldering with friends (Steve E., Jeff B., Conrad S.). We met early on a Saturday morning and made our way to the Balcony Rock boulders to sample the easier problems and warm up our bodies. We ended up running a circuit of problems V5 and under, limiting ourselves to three attempts at most on any given problem. This way we kept moving and didn't lose momentum at one particular problem, as so often happens. The goal was to get to the upper Highlands area. As we began circuiting problems our talk quickly turned to particular problems that gave each of us trouble or seemed to be wrongly graded, in other words sand-bagged. After a few hours of bouldering we had climbed a bunch of great problems, taken some good pictures to capture the action, settled on revised grades for those troubling problems, and even established a new problem together. Our revised grades have been meshed with the existing Mountain Project beta, some description text has been revised, some pictures added, and the new problem we all sent together is now in the database. The tick list went as followed, and pictures are below the tick list (click "read more"). A pair of Peregrine falcons is attempting to nest on the cliff face of Maryland Heights in Harpers Ferry National Historical Park. Park and US Fish and Wildlife staff have observed the falcons building what appears to be a nest on the cliff face. 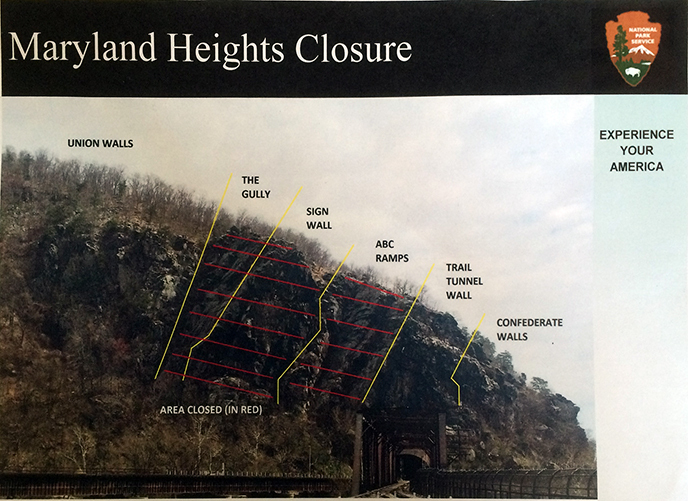 To protect the nesting birds from inadvertent disturbance or harassment, areas in and around the cliff face of Maryland Heights will be closed effective March 1. The areas will be closed to all visitor use, including climbing activities, along the cliff face area. The climbing areas affected by the closure include all the routes in the Gully, Sign Wall and ABC Ramps sections. For the full details on the closure please visit the NPS webpage.